The River access at Cool Spring. “You should not blog about this trail” my wife said to me as we came upon the overlook. We had been walking along the trail for an hour enjoying open views of the Shenandoah River, the Blue Ridge Mountains and of a multitude of songbirds and raptors in overgrown meadows without passing another soul. When we came to the high point where we could look back west over the patchwork of farms dotting the Shenandoah valley to the Allegheny Mountains in the distance, it almost sealed the deal – we can’t tell anyone about this place. The irony is that most people know its here and on the weekend it used to be packed – but now it’s been virtually left to the birds that inhabit it, including an impressive array of hawks, songbirds, eagles, herons, kingfishers, woodpeckers and waterfowl that enjoy a uncommon network of overgrown meadows – a rarity among lands that have either been farmed, developed or forested since the civil war. The hike is on a paved path and can take several hours at a leisurely pace. It is ideal for kids and for folks who cannot manage a more physically challenging dirt trail. It is almost entirely open, with views of the surrounding river and hills. 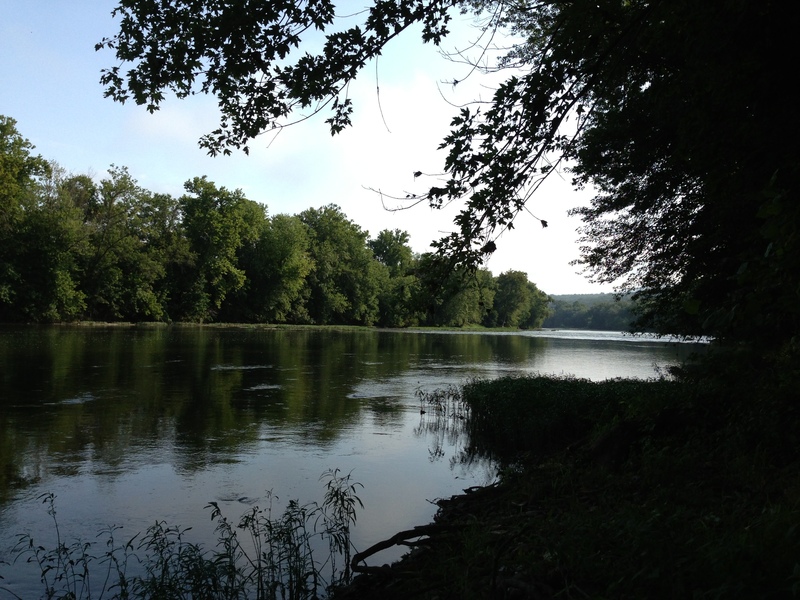 There are even a few places with easy access to the River – a feature nearly unheard of in this part of Virginia. So despite my desire to protect the identity of this amazing resource and frankly to indulge in a walk without seeing to many of my own species, I should respect the spirit of the owner of this property when they decided to make it publicly accessible in what I consider an act of monumental generosity. Folks in the area may know this place as the Virginia National Golf Course, a beautiful course along the Shenandoah River near Berryville, VA that went out of business several years ago. Enter Shenandoah University who bought the property as part of the establishment of an environmental and historic studies program and then put it in a permanent conservation easement which includes managed public access. Until a more permanent management plan is adopted through SU’s work with several local conservation and environmental groups, the course has been allowed to slowly revert back to nature while the paved cart path remains. This has created an exceptionally beautiful and open series of meadows along the Shenandoah River which act as a bird magnet. Within a year, the University expects to have a management plan as well as interpretive signs for both the ecological features as well as the important history of the property as a civil war battle field that saw action during the battle of Cool Spring. But for now, this property is simply one of the prettiest walks in the region and amazingly, free and open to the public. To find the “trailhead” look for the Shenandoah University sign at the Northeast corner of the intersection of VA Route 7 and the Shenandoah River, about 25 minutes west of Leesburg. Take the gravel entrance road to the end where you will find a parking lot in the middle of the old golf course. The trail goes either way from there along the river in a rough figure 8 with the parking lot in the center. And if you run into someone who works there, don’t forget to thank them and Shenandoah University for their generosity in sharing this great resource with the public. Thank you for this post. It sounds like a beautiful place, and I hope I can go there sometime in the future.